Toronto’s UP Express is here! Toronto finally has a train link to the airport! 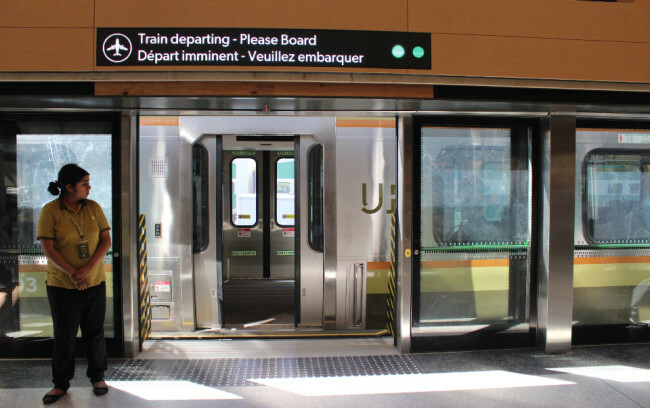 The new Union Pearson Express (UP Express for short) started operating on June 6, 2015. Last Wednesday, I participated in a media event that provided a preview of the stations and the train ride itself. If you’re curious about this long-awaited addition to the Toronto transit landscape, then read on. Whether you arrive at Union Station from the subway, GO train, Via Rail, the underground PATH, or from the street, you need to go to the station’s departure level and then walk west to the skywalk (as if you were heading to the Convention Centre). You’ll soon see the large UP Express lounge on the left hand side. A lot of thought has obviously gone into the design of the UP Express Union Station. From the interior design, to the choice of retailers, to the train staff’s uniforms. President of UP Express Kathy Haley explained that the idea was to give the station “a sense of place”. The airy space draws the eye upward, toward the natural wood beams that stripe the ceiling and second floor windows, and bring to mind trees in a forest. The earth tones and cool greys used in the decor were chosen to reflect the four seasons of Ontario. 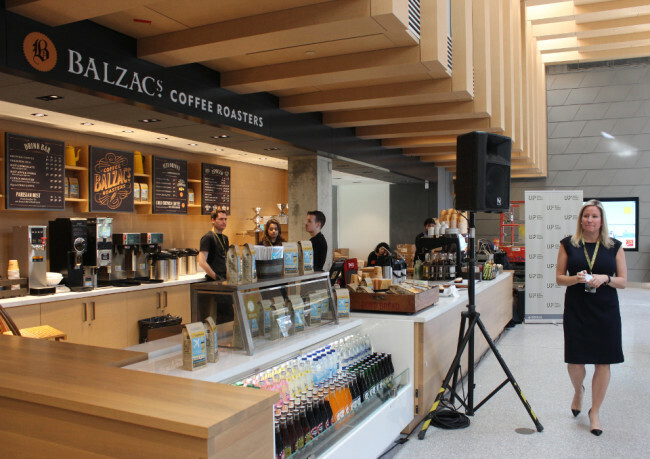 To your left as you enter, the Balzac’s Coffee shop is a welcome sight to those early morning passengers. I was relieved to find out that UP had chosen Balzac’s (a small Canadian chain) over Starbucks or Tim Hortons! After getting your coffee you may wish to purchase a little souvenir at the Drake General Store. I noticed tiny bottles of maple syrup (small enough to fit in your “liquids” zip-lock bag), books, and T-shirts among other things. Pop-in retailers such as Saxon Chocolates and Dufflet will also have booths here on a rotating basis. Next you continue on to the service counter or ticket machines to buy your passage (unless you’ve already purchased it online). You’ll save $2 if you buy a return ticket versus two one-ways. 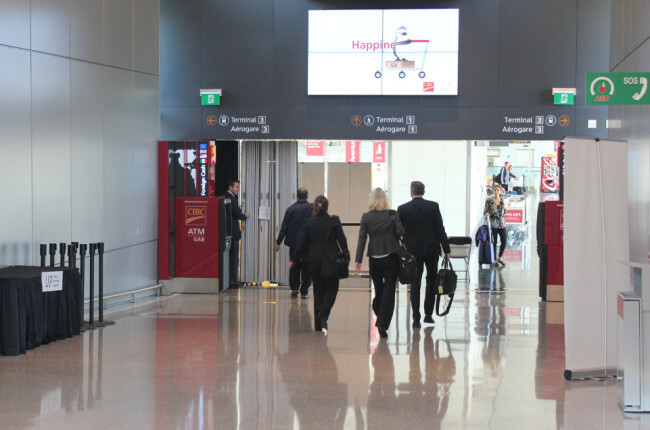 You can then move on to the large wall-mounted screen to check your flight status, then check-in and get your boarding pass and luggage tags from the machines. (You have to wait to be at the airport to check your luggage though.) Next, plop yourself on a comfy sofa next to the fireplace to wait for the next train. If you need to get foreign currency, a CIBC ATM nearby dispenses Canadian dollars, US dollars, Pounds, Euros, and Mexican Pesos. Since CIBC is UP’s major sponsor, they got the upstairs lounge named after themselves (opening in early July 2015). Mill Street Brewery will have a kiosk up there if you fancy some Canadian craft beer before or after your flight! Trains arrive and depart every 15 minutes. Glass doors slide open on one side of the lounge and you step right in without having to go outside, a big plus during the freezing winter days. With its distinctive earth tones that reflect those in the station, the UP Express train is easily recognizable. You’re also bound to notice the UP Express train staff sporting those retro uniforms. They were so cute I couldn’t stop taking pictures of them! Designed by Matt Robinson and made here in Canada, the uniforms hail back to a time when train and air travel were still considered “special occasions”. The train features classic rows of seats in a 2-2 configuration, luggage racks near the doors, overhead bins, charging stations, and WiFi. Your seat comes with a free copy of the UP Express magazine, as well as a flip tray. Washrooms are available should you need them during the short 25-minute trip. The ride itself is very smooth, and you might feel as if you were in a plane if it wasn’t for that characteristic train pinging sound and the landscape rolling by. The train stops briefly at the Bloor Station (near Dundas St. West) and Weston Station before continuing on to Pearson Airport. Part of the existing GO rail network is being used by the UP Express, but an elevated section had to be built to cross the highway and ramps and lead straight into the airport. At 3000 metres in length, this rail bridge is the longest in Ontario, and stands 28 metres above ground at its highest point, providing panoramic views of the surroundings. The trains operate from 5:30 am to 1:00 am. Consult the UP Express website for a detailed list of fares, but currently a one-way ride from Union to Pearson costs $27.50 CA$12.35 for adults (full fare). With a PRESTO card (a $6 rechargeable card used on public transit) the price is only $19 CA$9.25. So for those who feared that UP Express would be too expensive, you can now relax as the price is very competitive with other large cities, and also very similar to cheaper than the now defunct Airport Express bus. 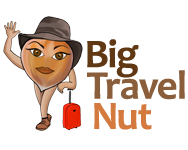 If you’re travelling from downtown, especially if you’re on your own, this is now your best bet to get to the airport quickly and comfortably. Once the train pulls into Pearson Station, you’re only 100 metres away from the entrance to Terminal 1, and steps away from the shuttle train that takes you to Terminal 3. 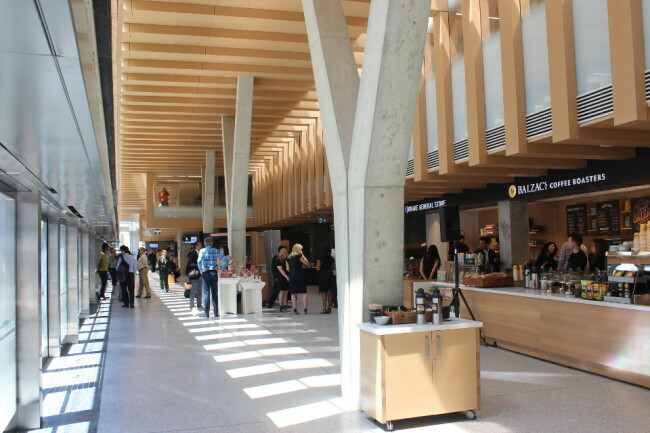 The “station” is a simple platform that repeats the wooden patterns and Y-shaped columns of its Union counterpart, but offers no reason to linger. It does however have ticket vending machines, WiFi, and multi-currency ATMs. I am really glad Toronto finally has an airport train link like most European cities. All I can say is: it’s about time! 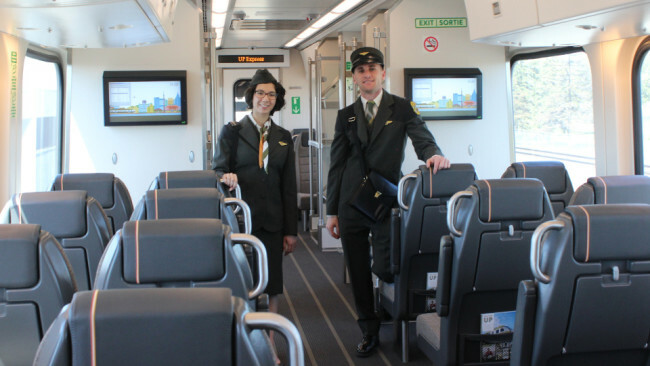 Are you planning to take the UP Express next time you go to Toronto’s Pearson airport or fly into the city? Toronto layover – what to see and do Free summer events in Toronto 5 things I love about Toronto and 5 things I hate Montreal or Toronto: which should you visit?